The Garmin Nuvi 2757LM 7-Inch makes an impact on Lifetime traffic and map updates like none other. It has a TFT touchscreen on a 7-inch screen. With lifetime updates that includes maps from all corners of the world including the United States, Canada, Mexico, Bahamas, Puerto Rico, and the U.S. Virgin Islands, this best RV GPS is a step ahead of the game. It has voice commands so you do not have to lift a finger to get accurate navigational access. The Garmin RV 760LMT Portable GPS Navigator is the editors’ choice. If you want something that’s customizable based on your RV’s size, go for this one. It has specialized RV routing features including height restrictions, alerts for road narrows, sharp curves, lateral wind assists, and tree over-hands. The voice-activated feature makes all this easy and quick. And this device is also compatible with other backup devices for keeping your travel history handy wherever you go. The Spy Tec STI GL300 Mini Portable is the kind of device you should have bought months ago. It takes two steps forward with its Google Maps feature. It gives real-time updates on the tracker, is Bluetooth compatible, and works on any app including a standard internet browser. A bit different than other picks, the Spy Tech gets the job done. Other features include a built-in accelerometer, strong battery life, and geofencing restrictions. Everybody loves an RV, be it parents or children. Driving up the coast or heading to a park miles away from your hometown can be an exciting time for a family or a group of friends. But without GPS, you waste time getting lost and asking for directions. So, don’t you think the best RV GPS could make a good mother’s day or father’s day gift? Or if you’re looking to spend some quality time with your children, won’t a secure RV GPS keep you satisfied so you can explore the best of the best destinations without jeopardizing your children’s health? You have some thinking to do, at this point! While there are many types of GPS that you can use in your RV, the best ones aren’t that easily found. GPS stands for Global Positioning System which means that you’re never getting lost for as long as you have connection. Most of you are more than familiar with how smart technology is taking over everyday lives making it easier on us to travel without getting lost or asking for directions. It makes us for time-efficient and cars more fuel-efficient. So, if cars can have their own smartphone-compatible or telematic GPS, why can’t RVs? There are 5 main types of GPS that you can choose from: a smartphone-compatible GPS app, in-car infotainment factory GPS, Android or Apple GPS CarPlay, telematics systems, or portable GPS. Each system has its own way of working and its own advantageous based on what you’d like to use. This standard positioning service was then upgraded to smartphones for citizens to help them navigate to new places without getting lost. The accuracy and efficiency of GPS navigation soon took over most devices as the integral and critical part of technological modernization. So, how does a GPS work? A Recreational Vehicle, or an RV, is used for temporary accommodation as well as transportation. Some examples of RVs include a motorhome, caravans, pop-up campers, truck campers, camper-vans, etc. If you want something specifically for trucks, and not RVs, go for the WorldNav Truck GPS models. A standard RV GPS comes with a kitchen, bathroom, and one or two sleeping facilities. You can also install appliances such as an portable heater, air conditioning system, satellite receptors, and water heating systems in an RV. For example, most people use RVs for traveling from north to south or vice versa during the winter or a warmer climate in the United States or Canada. Relying on paper maps can be ineffective for long-term use as paper maps get can too confusing to track down. Especially for when you’re trying to track down your own location while you’re on the road. So, while RVs are used for transportation for much longer distances than cars, buying an RV GPS is essential, right? You need a trustworthy and durable GPS mount so you do not have to upgrade to a new one in a matter of months. Based on the GPS you buy, a mount is essential. The mounting hardware either consists of a magnet or a rigid arm to attach to an external unit. Such mounts are easy to install, durable, and cheap to even consider buying. Generally, an RV GPS comes with a cable wire that plugs into the mount with a snap-in and snap-out functionality. Note: Most mounting hardware are backed by local laws for restrictions, so make sure you check your local laws for mounting placements and other limitations on installation before use. By habit, a larger screen size is more convenient than a small one. This calls for better safety and attention when traveling on the road. With a smaller screen size, you have look at the screen maybe 2-3 seconds longer than you would at a large screen size. So, which do you think is more convenient for you. For example, for real time map updates, when you’re driving an RV alone, you need a large screen for quick location tracking. If you have someone with you sitting in the passenger seat, the size of the screen doesn’t matter because that person is doing all the location tracking for you. RV travel is difficult unless you have something has handy as a big-screen RV built-in GPS by your side. So, screen size is essential. You get the best portable RV GPS with screen sizes ranging from 3.5 to 7 inches. Most come with touchscreen features that allow you to quickly track the route you’re on and how far you have left to go. One downside to large screen is the amount of dashboard space they take up. They may obstruct the view of the road, especially when you’re mounting it right in the center of the dashboard. The most comfortable screen size for consumers is somewhere between 4 to 5 inches. It makes location tracking and navigation easy to use, accessible, and intuitive for users. That way, the windshield is clearly visible for the driver. Traffic tracking is an essential feature of a GPS. It helps you make most of your time and vehicle’s fuel by staying up to date about the areas where you will get the least and most traffic. This helps especially when you happen to stick to a common commute or routine when traveling. A traffic tracking feature uses real-time and locating tracking to give you accurate traffic updates. In case there’s an accident, road closure, or a speed trap, you’ll know of it immediately with the help of this feature. The best technology for accurate real-time tracking are phone apps. Other types of technology such as portable GPS or pre-infotainment systems with built-in GPS aren’t as accurate at traffic tracking as phone apps. For the latter technologies, you might have to pay an additional cost to get real-time traffic reports. Additional features for traffic tracking, that most modern GPS devices offer, are detour request and lane assistance. Detour request is when you want to find an alternative route due to traffic or an accident. You can manually select or let the device select a better route for you which is faster. Lane assistance informs you of where you need to go next on your route. The general left and right turns that you might miss on a highway can easily be taken care of with lane and roadside assistance. So, you never have to re-route after missing an upcoming right-turn again! Does your RV GPS have a long battery life? Is it battery-operated or do you need to connect it to the power backup of your vehicle for consistent tracking? All these questions are important when you can proper tracking and navigational assist. Map updates is not a thing to take likely, especially when you’re traveling to new locations. Hence, paying an additional cost for longer battery life is essential and could probably save your life. We would recommend a wired RV GPS device for continuous real-time performance. Battery-operated devices usually go for as long as 2 hours until you need to charge the batteries up again. 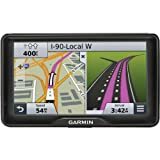 Garmin is known for its GPS accessories and lately it has become even more popular for its Nuvi 2757LM 7-Inch Portable Vehicle GPS. This one has Lifetime Maps which means you get map updates around the clock! With Real directions coupled with Real Voice guidance, this best RV GPS is available for all. It offers detailed visual quality that beats GPS devices that sell for more than double its price. If you want multiple route updates, just sit back and switch to its Auto Sort mode which organizes all routes for you to give you the fastest and most comfortable route. The Active Lane guidance feature is good for intelligent mapping, so you’re always heading in the right direction responsibly. We especially liked the photoReal and photoBird’s Eye feature. This feature gives you a good Bird’s eye view of your map, which is helpful when you’re new to the area. The Garmin excels at GPS technology and with good reason. The 7-inch TFT touchscreen makes accessibility easy. And so does the manual-orientation and white backlight display. And if you think that’s it- Garmin surprises you with Real Voice guidance. If you ask us, the Garmin is best for most people driving an RV – be it for the first time! The way the Garmin RV 760LMT works is hard to beat for any other Portable GPS Navigator. It has some major improvements in design and performance such as the customized RV Routing. With voice-activated technology, this best RV GPS, surpasses every limit. It responds to your voice, gives you command for intelligent routing, and comes with a touchscreen interface so you never have to take your hands off the wheel again. Upgraded with free lifetime map updates and traffic tracking, the Garmin has a wide directory for planning as well as sharing. All this through a 7-inch display makes it one of the most productive models on the market. It won’t be difficult to get used to this GPS device’s interface and software as it’s intuitive and simple. It also offers miscellany data such as nearby and efficient fuel stops. In case of an accident nearby, it re-routes you immediately around every accident or hold-up with difficulty. Overall, the Garmin’s size is comfortable, in spite of being a 7-inch screen. Its mounting hardware fits all kinds of mounting cups, including those that are designed to hold 4-inch screens. Have you ever used a model that asks you for your RV’s dimensions for better map tracking and routing? This one does! The Spy Tec STI GL300 Mini Portable is a seriously good RV GPS tracker for most people. It isn’t pricey, works with everything and on everyone, and lasts for the longest time possible. We love the Spy Tec for its accuracy and effectiveness. It is a real-time tracking device which allows you to track down people and objects that are dear to you. Especially for children, this device can make sure they’re safe while heading out with friends or coming back home from school. While children’s books dictate the world is a happy place, you still need cutting-edge technology which keeps you up-to-date on everyone. This portable GPS takes into account a simple geofencing technology. The geofencing technology shows you geographic locations and boundaries of your choosing. Plus, with a longer lasting battery life which supports the device’s built-in accelerometer, the Spy Tec is one step ahead of the game! You can use this tracking device from any modern browser, which includes iOS Android. The Spy Tec is a showcase for how accurately solid a tracking device can be. Plus, the model will allow you to set boundaries or location limits. It has a strong battery, intuitive functionality, and inexpensive design. All important features set in one makes the Spy Tec GL300 Mini the best RV GPS for extended use. The Magellan RoadMate RV9145-LM is good for a motorhome. You can feed in all the information regarding your RV and it keeps you off roads that aren’t safe for you. This is especially helpful for when you’re approaching RV parks. The Magellan RoadMate GPS and Good Sam have come together to give you this striking and durable product. It’s the best Sam’s Club RV GPS for a long trip to unknown places. So, RVers can stay rest assured about their course ahead because the campground rating and services of this device are nothing short of reliable. The customized route profile based on your RV makes traveling to new places much more realistic. And with Highway Lane Assist, you can stay on the correct lane when approaching exits. If you’ve driven an RV or a trailer before, especially those extremely bulky ones, you know missing an exit on a highway is likelier than you think. So, with the Magellan offering voice commands and multi-destination routing, you don’t have to anticipate a delay in arrival ever again! Other important features include an A/V input, Auto Night Mode, premium map updates, and One-Touch menu. Updating the software takes no hassle at all. You can pair this device to most other systems and it works perfectly. With Lifetime updates on both maps and traffic, the TomTom Go 620 is a class act. It claims to be the smarter, quicker, and a better choice for a GPS device. And we think it’s right! With a solid 6-inch screen size, it supports cloud updates as well as hands-free calling. With it you get a magnetic mount, a car charger, a USB cable, and a simple user guide for further assistance on how to make the most of this best RV GPS. You can connect it to the wi-fi connection and your smartphone for hands-free calling, text message updates, and traffic tracking. The voice commands keep you comfy and most important of all – safe because you don’t need your fingers to navigate through the device. TomTom Go 620 is one of the best devices for RVing and RV parks. If you’re going on a long trip, having this by your side will keep you safe and well-aware of the road ahead of you. Most of all, the screen is so big and the visuals so striking, that even if you wear noise-canceling headphones, you will stay understand where you need to go. We hope you appreciate this pick for full-time RVing as much as we do. The Garmin Dezl 770LMTHD is higher up on the market than others. It has a 7-inch glass display with lifetime map updates and HD digital traffic tracking. Both these features have a secure “lifetime” tag on them which means you can use it for as long as you want. The best feature of the Garmin is the Truck and Trailer Services Directory which lets you get in touch with high-rated and professional truckers also on the road. Based on the accurate information of your trailer, you get customized routing features for a safe journey. It notifies you about all the sharp turns, road narrows, road grades, weigh stations, stateliness, etc. when you’re on the road. We think the navigation and re-routing features of this best RV GPS are on point! Nothing beats down a device that warns you about tough roads ahead including possible accident-prone areas, ground restrictions, speeding limits, and high wind areas. It is one of the smartest GPS devices we’ve booked yet. With effective voice commands, which we hear is better than all of Garmin’s models, you do not have to lift a single finger for directions. The glass display remains striking and visual even under direct sunlight. So, no shade and no bleached-out visuals on a sunny day. The Garmin Nuvi 2639LMT might not be better than the Garmin Dezl 770, but it’s definitely good for in-dash navigation for a small travel trailer. It comes with a 6-inch screen size and a dual-orientation display. All you have to do is pinch the screen for a more zoomed-in display of the maps and you’re done! It is backed by Garmin Real Directions feature which updates you on all real-time traffic and landmarks for better routing and re-routing. Now, you can find restaurants, gas stations, and other important landmarks in no time. This RV GPS navigates the most complex roads like it’s no big deal. And with both horizontal and vertical screen compatibility, you can see where you are without taking your eyes off the road! Based on our research, the Garmin Nuvi works well for trips that are longer than 15 days. It is big enough for striking map directions and small enough to not get in the way. The perfect GPS device for trailers and motorhomes. Lastly, the slight drawback to this device would be the reflective screen which can get frustrating to handle. But once you find the perfect angle, viewing all your much-needed information on the screen is a piece of cake! As for a more accurate pick, the Magellan RoadMate 5230T-LM makes the final cut. It comes with a 5-inch screen size with lifetime traffic alerts and map updates. It is the best guide you need for quick street names, landmarks, and other information. It also provides parking information for garages, parks, and other grounds. This includes the operating hours of certain RV parks and proper directions to their entrances and exits. We like the Magellan RoadMate for what it is. It’s quick, efficient, and strong. With no additional charges, it gives you Traffic Camera alerts that are as sharp as the visuals of mirrorless cameras. Now isn’t that something you’d want for your RV? The TomTom VIA 1515M is powered by a lithium-ion battery. It has a 5-inch screen size with touchscreen features that make the device both intuitive and effective. It also features an integrated mount which attaches itself to your windscreen. You can also attach it to your dashboard for the best navigational support at your fingertips. The TomTom is a reliable and realistic GPS device for the money. You can use it for both short and long trips across the country. Plus, understanding the interface and software updates takes less than 10 minutes. That is, if you know how well RV GPS devices work. Overall, the sound control and menu control on this device is reliable and ideal for RVers. All you have to do is a press a button and whatever you need pops up! The TomTom VIA 1535TM is a step ahead from our previous pick. It has a resistive screen, a 5-inch Bluetooth-connected interface. With lifetime traffic and map updates, you can pair this device with your RV’s in-ceiling speakers or a wireless multi-room audio system for better performance and accurate navigational control. The split screen junction view is well-supported by voice navigation too. The battery charge life on this device is shorter than the others, which is only 3 hours, until it needs to be charged again. This makes its use limited, but not at all inefficient. Once you pair this with any Bluetooth device, including smartphones, it features hands free calling, roadside assistance, intelligent re-routing, and real-time travel data. On the plus side, it has a free two-day shipping option for those who just cannot wait! While most people look for the editors’ choice picks on the market, we’ve come to the conclusion that there’s no single best pick for everyone. There are many reasons why you’d need GPS navigation for your RV. Plus, modern versions of GPS navigation come with extra features that you’d not wait any longer to use. Features such as the Blu-Ray DVD compatibility, iPad app or iPhone support, multi-room audio support, a GPS tracking feature for making sure your children aren’t in danger wherever they go, and social media sharing apps for Twitter Instagram Facebook, etc. While you get to choose the kind of features you want in a GPS device, you need faster shipping too. That said, such important features need expert consideration. Which is why you need to rely on us to help you find what’s best for your RV. Why do I need a GPS device? A GPS device comes in a durable hardware backed by an intuitive software that can be stored and accessed easily. Companies are coming up with newer and newer ways to run different hardware and software to make performance accurate. However, a basic RV GPS unit offers location information along with real-time tracking. This can be used for personal reasons as well as for vehicles such as a trailer, motorhome, or an RV. Live tracking: Live tracking is when you can view a person or a vehicle connected to the GPS tracking device. You can view the location, movement, and real-time tracking signalling from a particular GPS tracker with the help of GPS technology. You get location tracking notification: This is important for people who commute a lot. Location tracking is also commonly referred to as traffic tracking as it lets you know the exact time estimation to and from a particular location. You can change locations manually based on where you are and where you want to go. Other important notifications can be road accidents, maintenance, etc. It also offers Safe Zone alerts for when you’re traveling through dense forest regions for a road trip. You can log into your travel history: The best part about using the best RV GPS is that you not only get lifetime mapping, but memory mapping. Which means the GPS device saves your routes without you manually save it. It consists of your entire travel history from where you’ve been to where you’ve reached. This helps you stay up-to-date on important addresses and stay ahead of schedule even when you’re moving on a new travel route. With in-app purchases you can also upload your travel history to the cloud and have it saved forever! Smart destination routes: Bored of the same route you take to a National Forest? If you want to check for alternate routes, a GPS device lets you do that. It is smart enough to detect the fastest and safest route to anywhere with a click of a button. If you have built-in wi-fi it also helps you re-route if you’re confused or unsure about the route you’re currently on. You need an upgraded GPS device for your RV immediately if you’ve been using the old-school map routes. And the Garmin Nuvi 2757LM 7-Inch is the one you need for all your digital traffic and map updates. The essential features that an RV GPS needs for better navigational support, the Garmin offers. It actually raises bar for how succinctly and efficiently a GPS navigator should perform.